A world without magnets would be a world without cell phones, computers, and more! 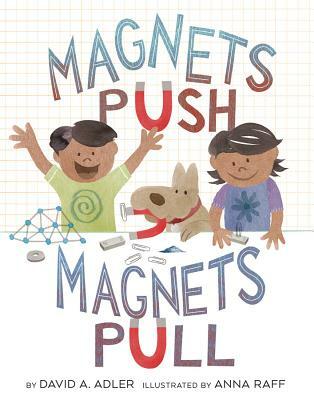 Explore the fascinating field of magnetism with this interactive picture book for young learners. Magnetism is all around us--even the earth is a giant magnet. Trusted children's nonfiction author David A. Adler covers the basics of magnetism, including compasses, for aspiring scientists. Hands-on experiments are smartly woven into the narrative. Want to test out the strength of a magnet? All you need is a bowl of water and some paper clips! Anna Raff's lively art illustrates scientific concepts clearly, with the added fun of two siblings and their dog exploring and learning together. Back matter includes a glossary that defines such terms as attraction, pole, electromagnetism, force, and more. Suggested activities on how to make your own magnet are also included. David A. Adler is the author of many children's books, such as Mystery Math: A First Book of Algebra and Fractions, Decimals and Percents. He lives in New York. Anna Raff is an award-winning illustrator of many children's books. She has an MFA from the School of Visual Arts and lives in New York City.